“Blockchain can radically transform exchange sector”, believes Kaidi Ruusalepp, CEO at Funderbeam (exchange for startups) and former CEO at the Estonian Nasdaq subdivision. On March 9, she will speak at Blockchain & Bitcoin Conference Tallinn. Being experienced in managing Nasdaq, Kaidi founded Funderbeam – an investment and research platform for finding investors and startups. At the end of 2016, Funderbeam team started creating a blockchain-based exchange. As envisioned by founders, the exchange should be an open platform for trading participants. Several companies and two private investors (one of them is Skype founder Jaan Tallinn) supported the project financially. Total amount of investments has already exceeded 2.5 mln dollars. Kaidi Ruusalepp is sure that blockchain implementation will solve the problem of transparency in the trading process and become “a financial engine of companies’ growth”. What issues will be discussed at the conference? 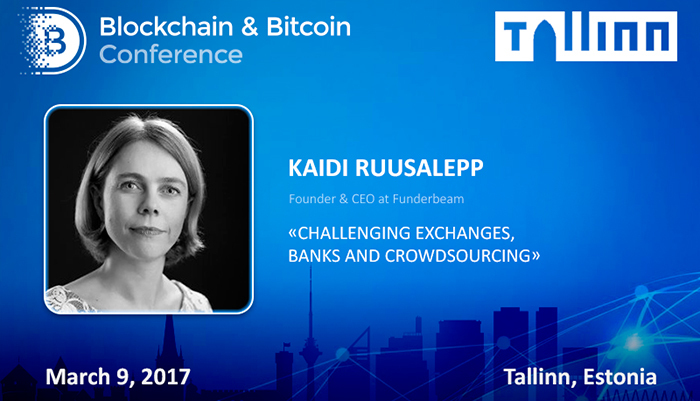 At Blockchain & Bitcoin Conference Kaidi Ruusalepp will tell you about new challenges faced by exchanges, banking sector and organizers of crowdsourcing campaigns. Her speech will be dedicated to prospects of using blockchain in exchange operations, experience of the Estonian Nasdaq business unit and tasks which should be tackled by authors of new projects (cases of Funderbeam and blockchain-based exchange). It will be interesting for startup founders, investors, stock trading participants and cryptocurrency entrepreneurs. Register to put a question to the speaker!